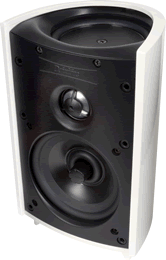 ProMonitor loudspeakers satisfy your need for small, easy-to-place speakers that deliver the true state-of-the-art, no-compromise performance you want. 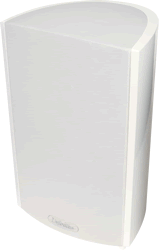 ProMonitor satellites are small enough to fit in the palm of your hand and may be wall-mounted, shelf mounted or used on floor-stands making them easy to integrate into any room and decor. ProMonitor and ProCenter are individually packaged satellite and center speakers that may be mixed and matched with ProSub subwoofers to custom build music and movie systems of astonishing performance capability: The sonic depth, width, and height reproduction and sound of these amazingly compact speakers is so big that Home Theater magazine said they "seem as though they are monster towers if you close your eyes." Don't let the ProMonitor 1000's small size and affordable price fool you-it is a remarkably sophisticated product with huge sound. The Pro 1000 incorporates many of the same technologies as Definitive's top-of-the-line models including BDSS drivers, pure aluminum dome tweeters, and planar pressure coupled mid/bass radiators for sound quality that will shock you. Their imaging is absolutely boxless, spacious and three dimensional while delivering pinpoint specificity and localization when called for. They are velvety smooth with you-are-there presence which is hard to find at any price and unheard of in this price range. The they are dynamic but capable of great subtlety so it excels equally with music or movies. 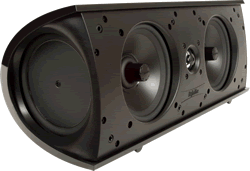 The ProMonitor 800 is Definitive's perfect size satellite speaker in the acclaimed Pro Series. Small enough to disappear in a room but beautiful when in plain view. 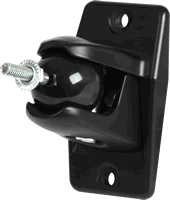 The 800 satellites can be shelf-mounted with their unique tri-lobed base, wall-mounted using the built-in keyhole mount or optional ProMount 80 articulating pivot mounts or stand mounted with their optional ProStand 600/800 floor stands. Don't let the ProMonitor 800's small size and affordable price fool you-it is a remarkably sophisticated product with huge sound. The Pro 800 incorporates many of the same technologies as Definitive's top-of-the-line models including BDSS drivers, pure aluminum dome tweeters, and planar pressure coupled mid/bass radiators for sound quality that will shock you. You'll enjoy the kind of rich, warm and life-like sound quality that you thought was only possible with big, hard to place speakers. Available in Black and White gloss finishes. 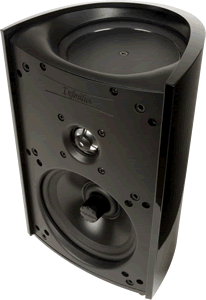 The ProCenter 2000 is Definitive's best center speaker in the acclaimed ProCinema Series. Its compact dimensions flat accurate frequncy reponse and outstanding dynamic range make the ProCenter 2000 a great choice for systems based around Definitive BiPolar Series speakers as well as systems based on ProCinema components. A ProCenter 2000 along with four ProMonitor 1000s and a matching ProSub 1000 makes a complete ProCinema 1000+ system. As much as 75% of a movie's soundtrack is played by the center channel loudspeaker making it arguably the most important speaker in a home theater system. It is the key to getting intelligible dialog and true-to-life sound effects. So we lavished extra attention on the ProCenter 2000. It features 2 of the same 5-1/4" BDSS drivers used in ProMonitor 1000 satellites along with two 5-1/4" mid/bass radiators on the sides of the enclosure, allowing it to play loud and clear with high tonal accuracy. 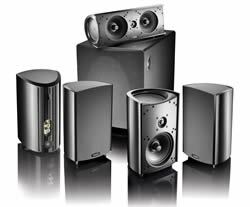 Don't let the ProCenter 1000's small size and affordable price fool you-it is a remarkably sophisticated product with huge sound. 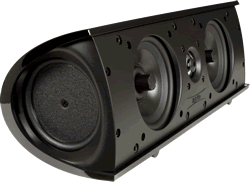 Competing center channel speakers of this size usually have weak lower-midrange response; that part of the audio range that contains the "warmth" and "body" of voices and musical instruments. Listen to a male vocal on typical small satellite speakers and you will instantly hear what we mean. The ProCenter avoids this critical problem by pressure-coupling our exclusive BDSS technology drivers to two equal-sized mid/bass radiators cleverly placed on the sides of the speaker. This technique doubles the lower-midrange/bass radiating area of the speaker without increasing the size of the enclosure. You'll enjoy the kind of rich, warm and life-like sound quality that you thought was only possible with big, hard-to-place speakers. Owners of ProMonitor 1000 and Mythos Gem XL rejoice! The ProMount 90 is allows you to wall mount your speakers and aim them toward your listening position for best sound quality. Sturdy construction allows the 90 to secure any speaker weighing up to 10 pounds that has a 1/4-20 thread insert.